LEAP Program Certification: Food sensitivies can show themselves in more ways than you think! Exciting News about more things that are happening at On Pointe Nutrition to better serve our clients! November is National Diabetes Awareness Month! If you think you may be at risk or you have been told you are pre-diabetic you should do a little self check or keep a food log to see how your diet is doing. If you feel like you need some help- give us a call, we would be happy to talk with you! There are a few things that are changing/ improving here at On Pointe Nutrition. As of next year (meaning around January/ February) On Pointe Nutrition will be able to accept insurance for Medical Nutrition Therapy! This program is intended to remediate the symptoms that patients have including IBS, Migraines, Fibromyalgia and other food sensitivity related disorders/ symptoms. I am really excited about this certification. This program uses the “MRT” blood test ( Mediator Release Test) which is a new test based on an innovative method of measurement of blood components that was previously not possible, it accurately isolates which specific foods and/or additives in food provoke any form of non-allergic hypersensitivity reactions by any class of circulating immunocytes . This previously undetectable non-IgE medicated cellular reactions release pro inflammatory and proalgesic mediators in specific organ systems and systemically through circulation. This causes a reaction that is not just in one spot in your body, but systemic, fibromyalgia is a great example of this. 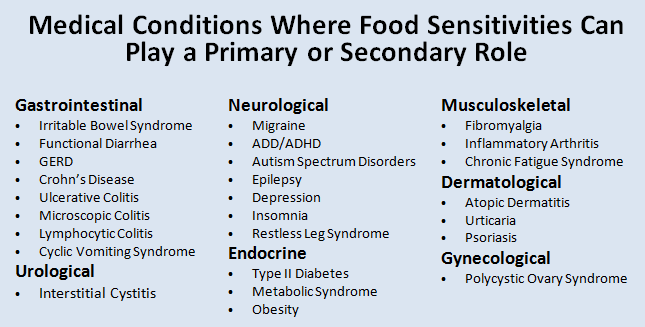 These reactive foods can cause unexplained muscle pain, headaches, mood disorders, hormone imbalance just to name a few. After this blood test is done there is different phases of the diet approach that lasts a minimum of 30 days, my clients involved will meet with me a few times in a month to assess progress, symptoms, etc. This program has been VERY successful and there are several clinical studies that back this. This program is used in a large amount of physician referrals to dietitians, which I am very excited about! The other good news- most insurance companies will cover this, and with On Pointe Nutrition soon being able to accept insurance this will help a tremendous amount! This test is similar to the ALCAT test, but the reactive foods are to be avoided longer and there are a few different aspects to these two tests that make them different. If you are wondering which one would be best for you, it really depends on your symptoms and how aggressive you want to be in treating you symptoms and put them into remission. I would be happy to meet with you and talk to you about your options and what I think would work best for you! Food and Nutrition play a huge role in our overall health. It’s about time that we look at the things that we put in our bodies everyday rather an seeking just a quick fix of medication or other forms to just numb the symptoms and in some cases cause more damage, rather than getting down to the route cause of why you are having systemic symptoms. One of my favorite quotes that is so true!! I am offering a 5 minute FREE phone consultation to answer any of your questions! 678-404-7442.